1. 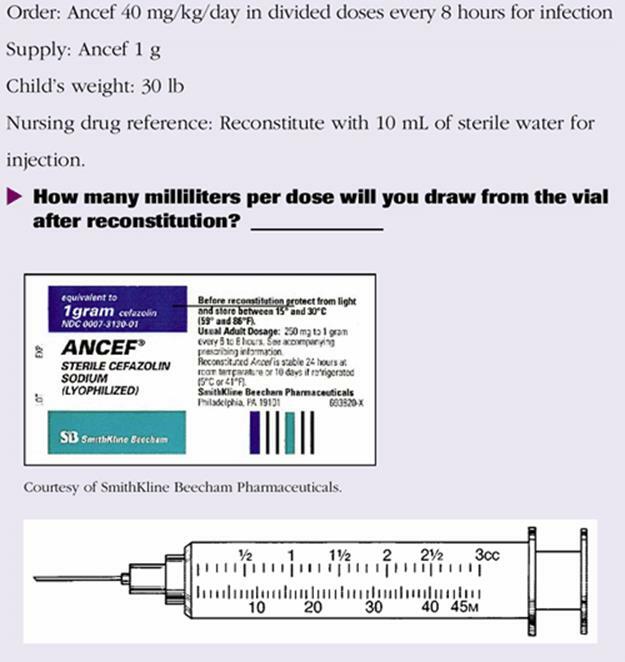 Calculate three-factor–given quantity to one-factor–, two-factor–, or three-factor–wanted quantity medication problems involving a specific amount of medication or intravenous (IV) fluid based on the weight of the patient and the time required for safe administration. 2. 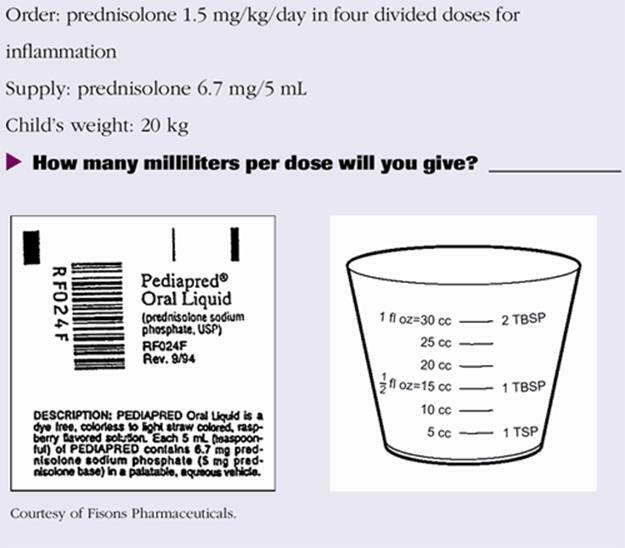 Calculate problems requiring reconstitution or preparation of medications using information from a nursing drug reference, label, or package insert. Three-factor–given quantity medication problems can be solved implementing the sequential method or the random method of dimensional analysis. 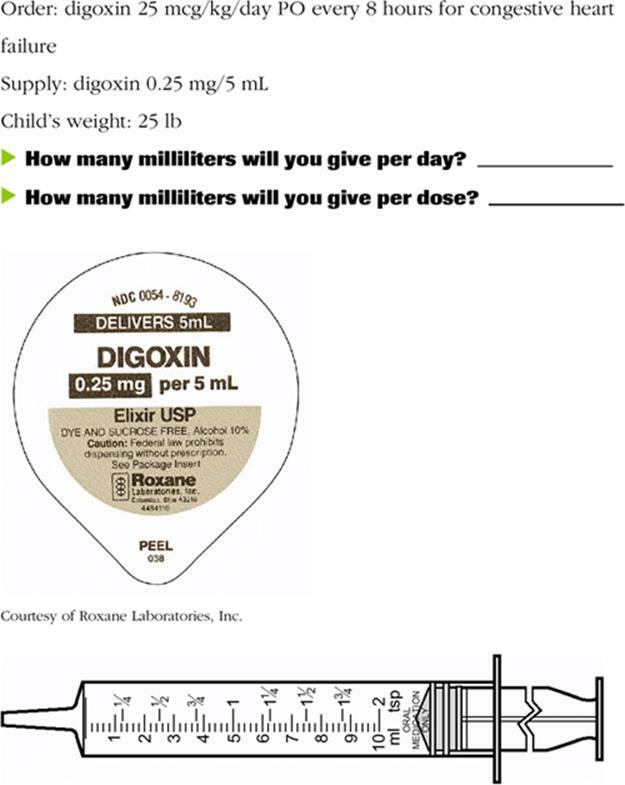 The given quantity or the physician's order now contains three parts, including a numerator (the dosage of medication ordered) and two denominators (the weight of the patient and the time required for safe administration). 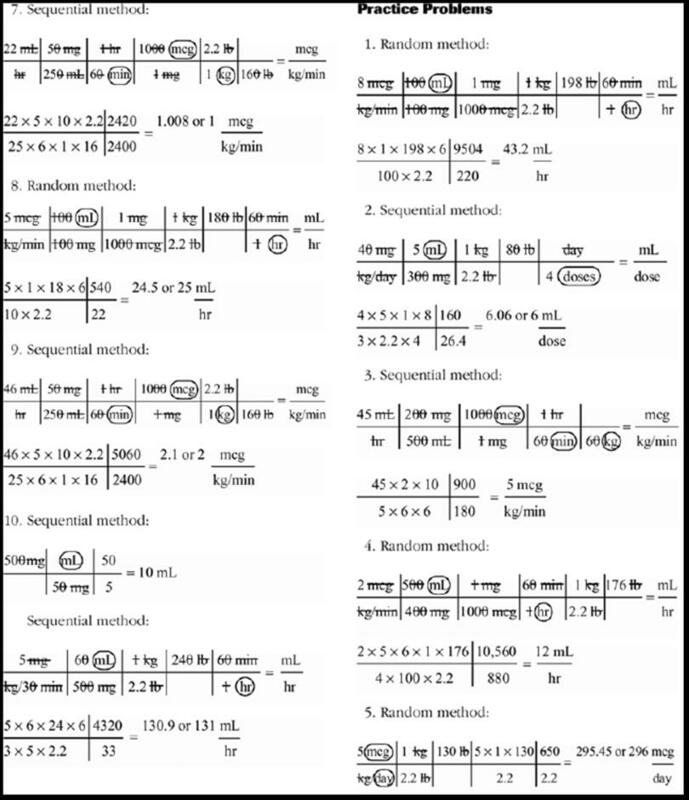 Below is an example of this problem-solving method showing placement of basic dimensional analysis terms applied to a three-factor medication problem. The three-factor–given quantity has been set up with a numerator (30 mg) and two denominators (kg/day) leading across the unit path to a two-factor–wanted quantity, with a numerator (mL) and a denominator (day). The conversion factors can now be factored into the unit path to allow cancellation of unwanted units. 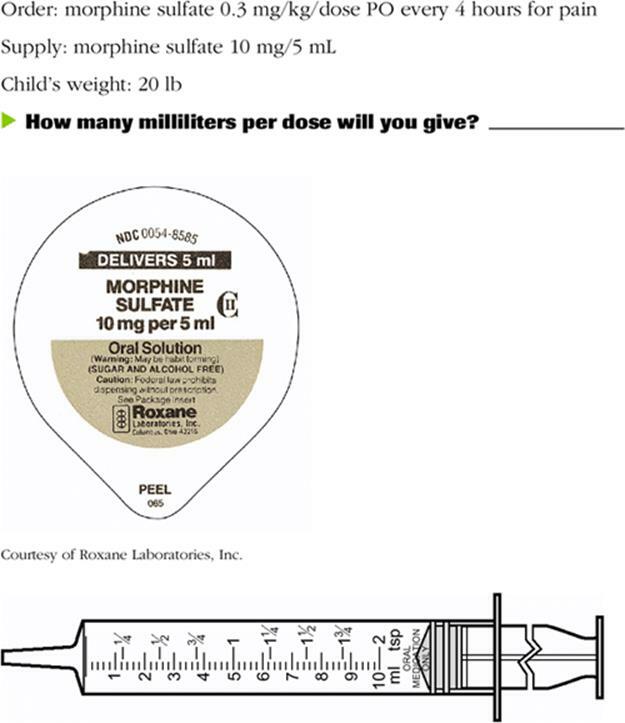 The dose on hand (300 mg/5 mL) has been factored in and placed so that the wanted unit (mL) correlates with the wanted quantity (mL) and the unwanted unit (mg) is canceled. The child's weight (22 kg) has been factored in and set up to allow the unwanted unit (kg) to be canceled. All the unwanted units have been canceled, and the wanted units are placed to correlate with the two-factor–wanted quantity (mL/day). Multiply numerators, multiply denominators, and divide the product of the numerators by the product of the denominators to provide the numerical answer. The wanted quantity is 11 mL/day. 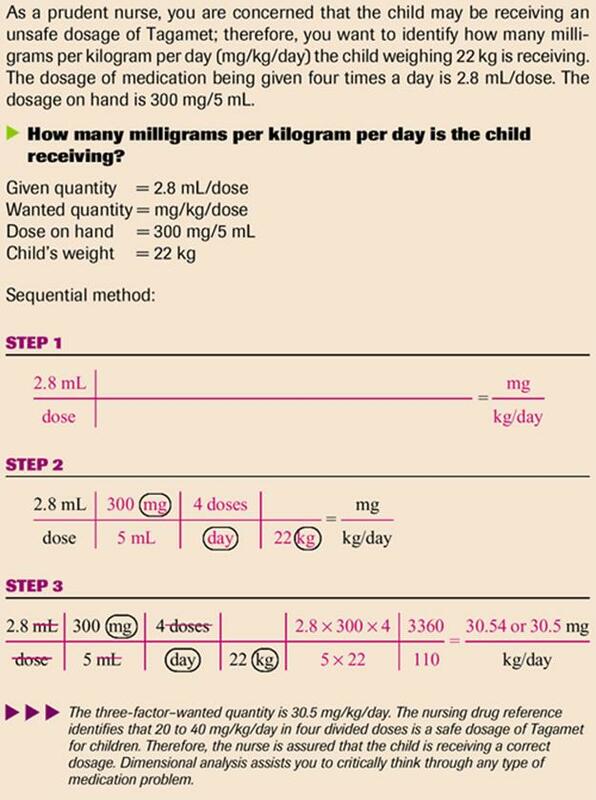 The child is to receive 11 mL/day in four divided doses; therefore, the conversion factor involves how many doses are in a day (4 divided doses = day). Every new medication order for a child should be carefully reviewed for errors related to dosage, route, and frequency. Many medication errors can be eliminated if a double-check system is in place for all new medication orders. 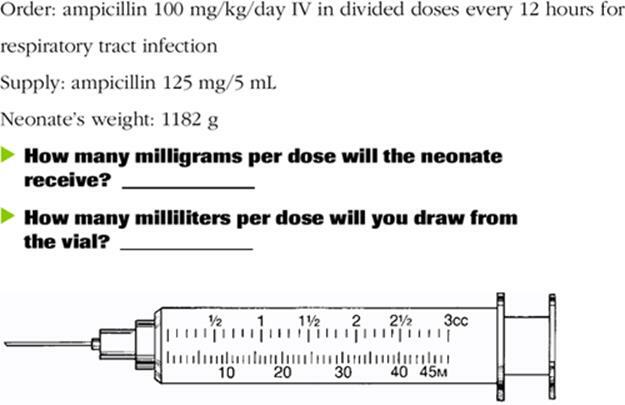 The two-factor–given quantity (2.8 mL/dose) has been factored in with a numerator (2.8 mL) and a denominator (dose). The three-factor–wanted quantity (mg/kg/day) also has been factored in with a numerator (mg) and two denominators (kg/day). The conversion factors have been added, and all unwanted units have been canceled from the problem. The wanted unit (mg) is placed in the numerator to correlate with the wanted quantity (mg) also in the numerator. The wanted units (kg and day) are in the denominator to correlate with the wanted quantity (kg and day) in the denominator. Knowing the Five Rights of medication administration can help to eliminate medication errors but another important consideration is being aware of the safe dosage range for each medication being administered. A Nursing Drug Reference lists the safe dosage range for adults, children, and infants. It is the responsibility of the nurse to be familiar with safe dosage ranges to prevent medication errors. The three-factor–given quantity has been set up with a numerator (5 mg) and two denominators (kg/min) leading across the unit path to a two-factor–wanted quantity with a numerator (mL) and a denominator (hr). By using the random method of dimensional analysis, the conversion factors are factored to cancel out unwanted units. The unwanted unit (min) has been canceled by factoring the conversion factor (1 hr = 60 min), and the wanted unit corresponds with the wanted quantity denominator (hr). 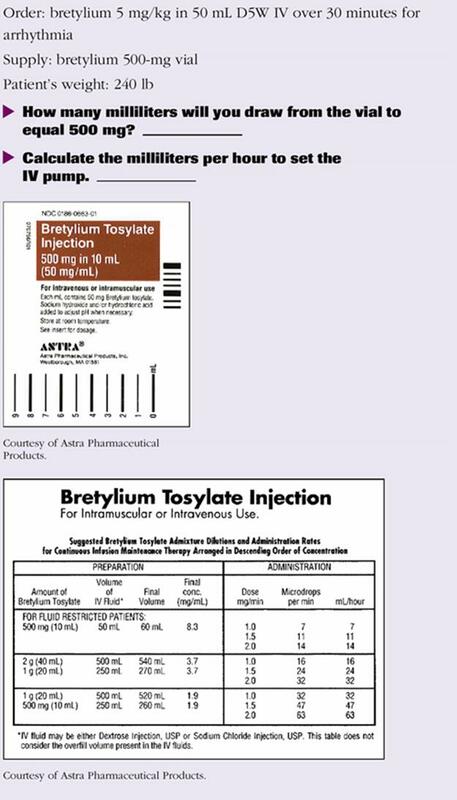 The dose on hand (250 mg/ 50 mL) has been factored in and placed so that the wanted unit (mL) corresponds with the wanted quantity numerator (mL). The conversion factor (1 mg = 1000 mcg) has been factored in to cancel the unwanted units (mg and mcg). The final conversion factors (1 kg = 2.2 lb) and the weight of the patient have been factored in to cancel the remaining unwanted units (kg and lb). All the unwanted units have been canceled, and the wanted units (mL and hr) remain in position to correlate with the two-factor– wanted quantity (mL/hr). Multiply the numerators, multiply the denominators, and divide the product of the numerators by the product of the denominators to provide the numerical value for the two-factor–wanted quantity. 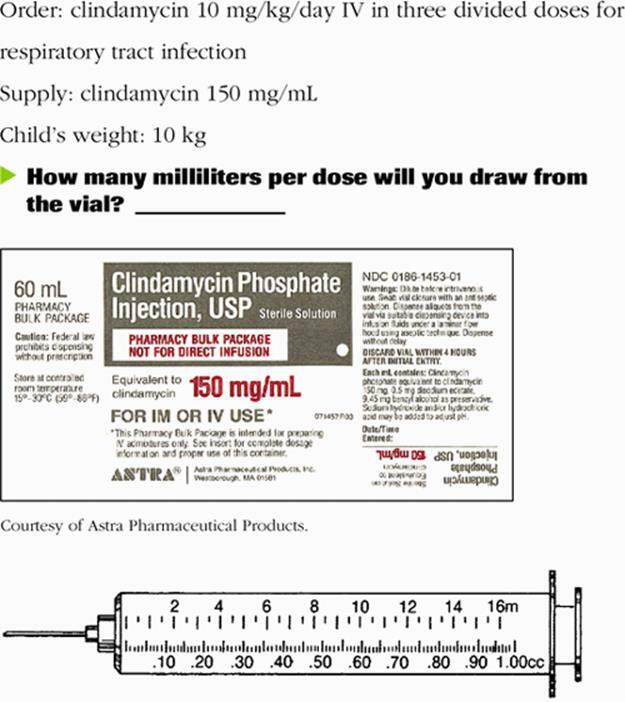 The two-factor–given quantity is identified as the information that the nurse obtained from the IV pump, and the three-factor– wanted quantity is the information that the physician has requested. The dose on hand (the IV fluid that is presently infusing) has been factored in to cancel the unwanted unit (mL). 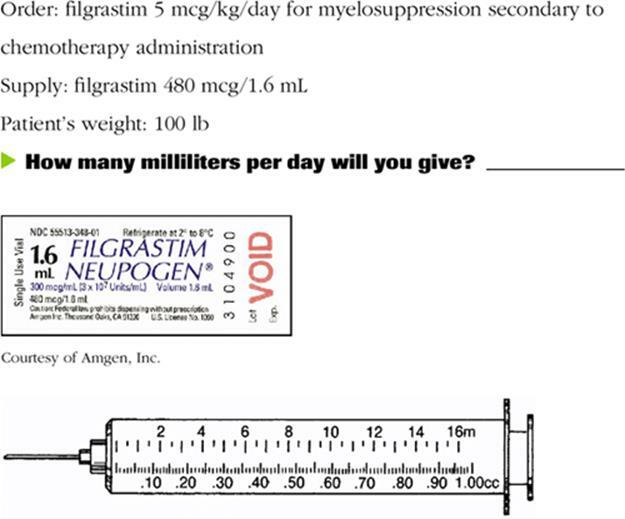 The conversion factor (1 mg = 1000 mcg) has been factored in to cancel the unwanted unit (mg). The wanted unit (mcg) remains and corresponds with the wanted quantity in the numerator. The conversion factor (1 hr = 60 min) has been factored in to cancel the unwanted unit (hr). The wanted unit (min) remains placed in the denominator. The conversion factor (1 kg = 2.2 lb) has been factored in to correspond with the wanted quantity denominator (kg). The weight of the patient also is factored in to cancel the unwanted unit (lb). After all unwanted units have been canceled and the wanted units have been identified, multiply the numerators, multiply the denominators, and divide the product of the numerators by the product of the denominators to provide the numerical value for the wanted quantity. Dimensional analysis is a problem-solving method that uses critical thinking. 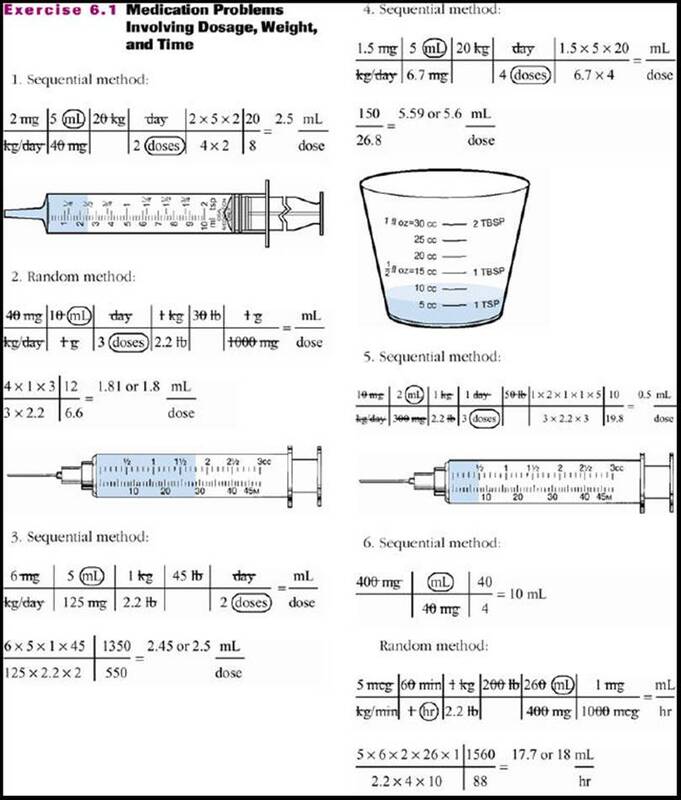 When implementing the sequential method or the random method of dimensional analysis, the medication problem can be set up in a number of different ways, with a focus on the correct placement of conversion factors to allow unwanted units to be canceled from the unit path. 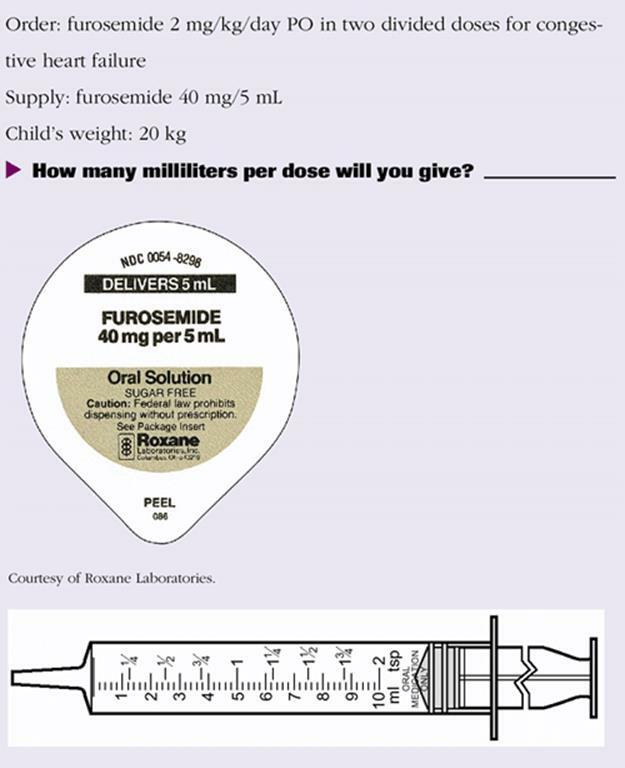 Dimensional analysis is a problem-solving method that nurses can use to calculate a variety of medication problems in the hospital, outpatient, or home care environment. The medication problems may involve one-factor–, two-factor–, or three-factor–given quantity medication orders, resulting in one-factor–, two-factor–, or three-factor–wanted quantity answers. With advanced nursing and home care nursing resulting in increased autonomy, it is more important than ever that nurses be able to accurately calculate medication problems. Dimensional analysis provides the opportunity to use one problem-solving method for any type of medication problem, thereby increasing consistency and decreasing confusion when calculating medication problems. When caring for critically ill patients, the nurse is responsible for titrating medication for the desired effectiveness (decrease in chest pain, increase in urine output, or increase in blood pressure). The weight of a patient is extremely important when administering medications to a critically ill patient because a change in weight (either increased or decreased) can change the effectiveness of the medication. To prevent medication errors, a daily weight is obtained on every critically ill patient. 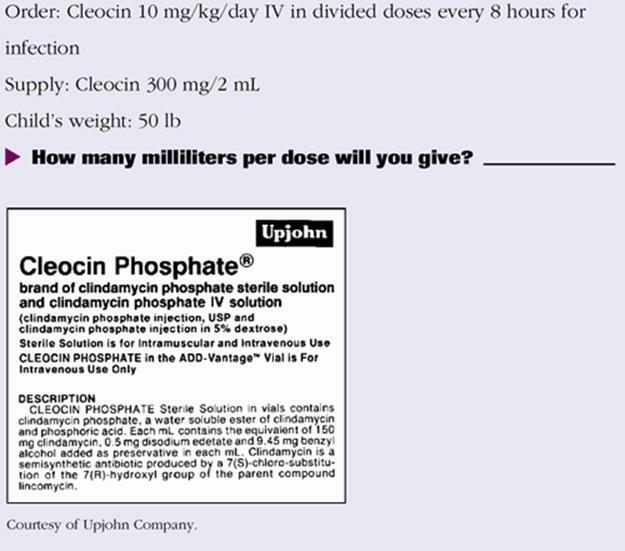 This chapter has taught you to calculate three-factor medication problems involving the dosage of medication, the weight of the patient, and the amount of time over which medications or IV fluids can be safely administered. 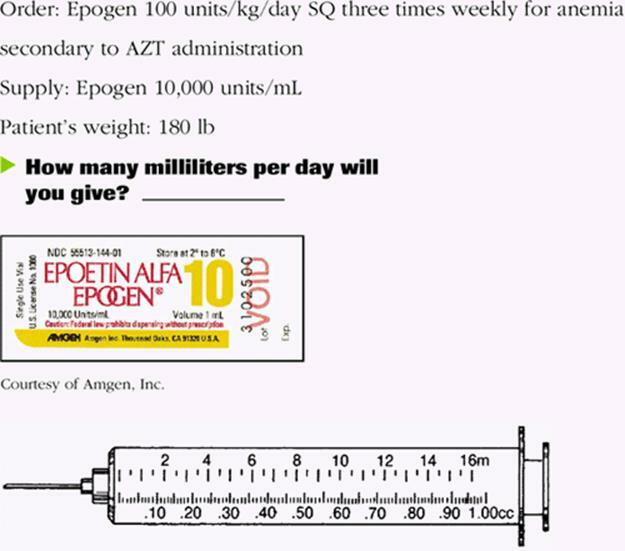 Using the sequential method or the random method of dimensional analysis, demonstrate your ability to calculate medication problems accurately by completing the following practice problems.